Damsons are a subspecies of plum that are normally quite tart and require cooking to remove the astringency. Cooking them sous vide helps retain the shape of the fruit by cooking at a lower temperature. Liqueurs give fruit a great flavour boost; try Amaretto or Frangelico for a subtle nutty flavour. Infusing the syrup with a little black tea before cooking will give an interesting flavour, as will adding herbs to the bag such as thyme or even tarragon. 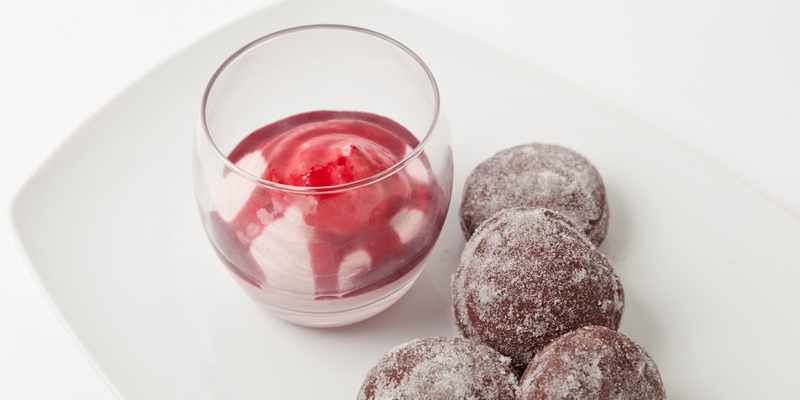 Adam Gray serves Warm chocolate doughnuts with a damson fool and James Mackenzie makes a damson ripple ice cream to go with his Chocolate, juniper and sloe gin pudding.